This article shows you how to configure Veritas cluster server for apache webserver with high availability on Linux. 1. Two server nodes (node1 and node2) with RHEL 7.0 - 64 Bit, both nodes are accessible each other. 2. Symantec Storage Foundation with High Availability (SFHA) 6.2 installed on both nodes. Refer this link to see how to install the VCS Cluster on Linux. 4. Installed httpd apache package on both nodes using yum, but not started or enabled to start the service during the boot. because cluster should take care of start and stop. Refer this link to configure yum repo server on Linux. 5. One shared iSCSI Volume from iSCSI storage and mapped to both nodes (/dev/sdb). Refer this link to create a iSCSI Volume and map or access a ISCSI Volume on nodes. 6. Create a Volume using LVM and export the Volumegroup from node1 and import to node2 as below. Once you have configured two VCS Cluster nodes. We can proceed to create a Service group for Apache Webserver on VCS Cluster. Before creating a service group for webserver, need to remember the following things. 1. Assign a unique name and instance number to service group (websg1) and resources (Example : webnic1, webip1, webmnt1, webvg1, webvol1, webapache1). Below image shows the service group and their resources which are required to bring our service group. 1. Make the VCS cluster configuration file into writable. 2. How to create a Service Group (websg1). 3. How to create a resources to the service group. 4. How to create a resource dependencies or how to link a resources. 7. Create a Webpage content for testing purpose. 8. Switch the Servicegroup manually from node1 to node2 to check the failover. We should make the configuration file as writeable to make changes. Create a dedicated servicegroup for Apache webserver. VCS NOTICE V-16-1-10136 Group added; populating SystemList and setting the Parallel attribute recommended before adding resources. Where websg1 is the unique service group name and instance number for our servicegroup. Define the default node to start the service group automatically. After the changes done with service group websg1, lets create a resources and add those resources to the service groups. Where webnic1 is the NIC resource name, NIC is the resource type and websg1 is our servicegroup name. Above resource webnic1 added and tells you to enable the required attributes. Define the network device to be used by this resource webnic1. Assign the Networkhosts to the resource webnic1. Check the status of the resource webnic1. Where webip1 is the IP resource name, IP is the resource type and websg1 is our servicegroup name. Above resource webip1 added and gives you an output to enable the required attributes. Define the network device to be used by this resource webip1. Assign the Virtual IP address to the resource webip1. so end users will be using this IP to access the webservice. Assign the Netmask to the resource webip1. Make the resource webip1 online. Check the status of the resource webip1. Where webvg1 is the Diskgroup resource name, LVMVolumeGroup is the resource type and websg1 is our servicegroup name. Above resource webvg1 added and tells you to enable the required attributes. Define the Volumegroup to be used by this resource webvg1. Make the resource webvg1 online. Check the status of the resource webvg1. Where webvol1 is the Diskgroup resource name, LVMLogicalVolume is the resource type and websg1 is our servicegroup name. Above resource webvol1 added and tells you to enable the required attributes. Define the Logical Volume to be used by this resource webvol1. Define the Volumegroup to be used by this resource webvol1. Make the resource webvol1 online. Check the status of the resource webvol1. Where webmnt1 is the Mount resource name, Mount is the resource type and websg1 is our servicegroup name. Above resource webmnt1 added and tells you to enable the required attributes. Define the MountPoint to be used by this resource webmnt1. Note: Use only the mapper paths, dont use /dev/webvg1/webvol1. Define the Filesystem type to be used by this resource webmnt1. Define the Filesystem check options to be used by this resource webmnt1. Make the resource webmnt1 online. Check the status of the resource webmnt1. Where webapache1 is the resource name, Apache is the resource type and websg1 is our servicegroup name. Above resource webapache1 added and tells you to enable the required attributes. Define the ConfigFile to be used by this resource webapache1. Lets define the resource dependencies by linking the resources, this is required as VCS needs to identify which resource should be online before other resources are made online. 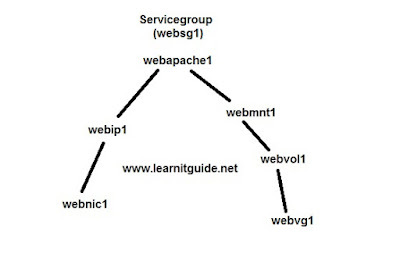 Check the dependencies belongs to the servicegroup websg1. Check the status of the resource webapache1. Note : Wait for few minutes, If status not showing online on node1, then manually run the below command. Output shows that our servicegroup websg1 is online on node1 and offline on node2. Our Cluster is ready to serve the webpage content. Create a “index.html” or keep your webpage content under /var/www/html. For testing purpose, We have added the content in the file index.html as "Welcome to VCS Tutorial by Learnitguide.net". You will see the content successfully. Thats all about the configurations. Lets check the failover working or not manually.. Execute the below command to switch the servicegroup manually from node1 to node2. Output shows that our servicegroup websg1 is online on node2 and offline on node1. Thats all about the configuration of VCS Cluster for Apache webserver with high availability on Linux.